Arrow remains one of my favourite companies with exemplary presentations of a remarkable range of titles. Richard Kelly’s first feature, made when he was twenty-four, was not a commercial success on its first release – largely because it so determinedly refused to fit into ready-made categories that it confused marketers, critics and audiences alike – but it eventually went on to cult status, gradually gaining recognition as a creative landmark. The story of a troubled teenager struggling with mental illness (he’s recently stopped taking his meds), oppressed by a world which tries to impose its conventional views on him even as he seems to be experiencing increasingly cosmic forces, it refuses easy interpretation of its narrative events, although each individual moment is rendered with clarity and precision. Are Donnie’s experiences all delusions of a disordered mind, or does his disordered mind give him privileged access to other dimensions? Time travel seems to be involved, with events looping back on themselves … Donnie is presented with a choice between futures, either of which involves apocalyptic tragedy; it’s up to him to decide which has more value for him and for those he cares about. Kelly’s debut, aided by a terrific cast led by Jake and Maggie Gyllenhaal, superb cinematography by Steven Poster, and an astute soundtrack which builds towards one of the great uses of a song (a cover of Tears For Fears’ “Mad World”) to drive and draw emotion from a montage of characters in pain and despair, is audacious and assured. It’s the work of a young filmmaker who has not yet been taught caution, unhampered by second thoughts and commercial considerations, and it remains his most fully realized work – although I’m a huge fan of the sprawling Southland Tales (2006) and admire much of The Box (2009), though I have reservations about some of Kelly’s conceptual choices in the latter. Too distinctive and idiosyncratic to fit into the mainstream, Kelly has had a string of bad luck with a number of projects which have fallen through during the past nine years, while his signature creation suffered the indignity of a studio franchise-minded “sequel” in 2009. Arrow’s dual-format edition includes both versions of Donnie Darko – I still prefer the original theatrical cut to the director’s cut, which alters some of the music, adds a few scenes and some unnecessary computer graphics. There are two commentary tracks for the original cut, and one for the director’s cut. There’s a new documentary about the making of the film, plus numerous archival featurettes and interviews, deleted and extended scenes, a short film by Kelly and a music video of “Mad World”. Jack Arnold’s best film is also one of the key works of 1950s science fiction. Adapted by author Richard Matheson from his own novel, it tells the story of an ordinary man who suffers a catastrophic transformation courtesy of vaguely defined chemical/radiation poisoning. Scott Carey (Grant Williams) begins to shrink, his loss of scale stripping away his masculine self-assurance until he becomes bitterly alienated from his wife Louise (Randy Stuart); he gets a brief respite with circus midget Clarice (April Kent), but when the shrinking resumes, he becomes irrevocably separated from human society. 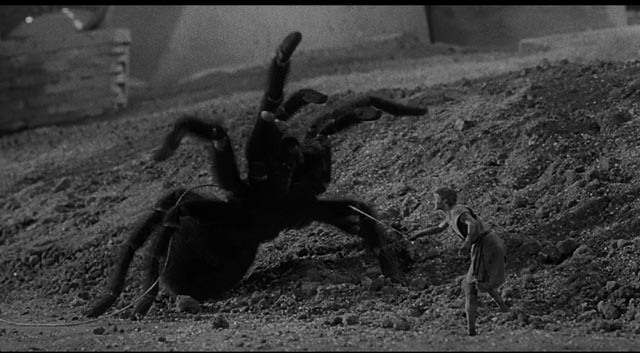 Attacked by the house cat, he ends up alone in the basement, a vast and threatening world where he must learn to fend for himself – finding shelter, foraging for food, and finally doing battle with a monstrous spider. 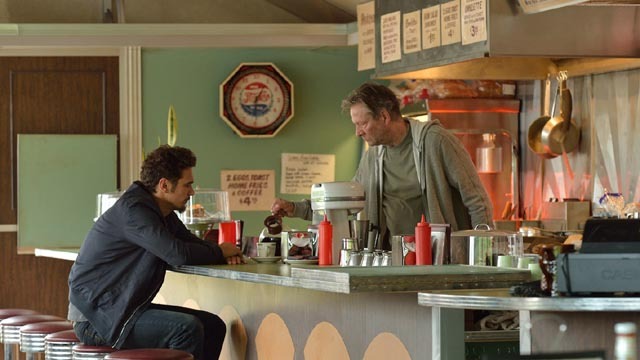 Resisting studio pressure to impose a happy ending with Scott growing back to normal size and reconciling with Louise, Arnold and Matheson managed to give the film an ending which is not conventionally reassuring but nonetheless asserts the survival of Scott’s humanity in the face of a vast and indifferent universe. 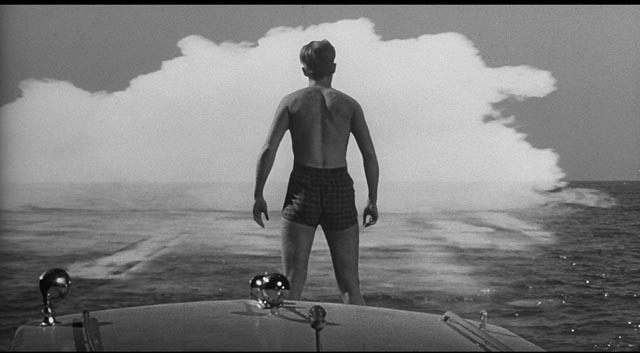 With its distinctive mixture of domestic drama, adventure and horror leading to that poetic ending, The Incredible Shrinking Man remains a resonant piece of entertainment long after many of its contemporaries have become mere dated curiosities. The hi-def presentation on Arrow’s Blu-ray does justice to Ellis W. Carter’s cinematography while also revealing the limitations of the effects techniques of the time. Composite shots tend to be grainier because of the additional generations required, but there are some surprisingly sophisticated effects, particularly with Scott and Louise in the same frame – you can think you’ve spotted the dividing line in the split screen only to have one or other of the characters suddenly cross over into the other part of the frame. Issues of scale are occasionally off, but Arnold keeps things moving quickly so these are seldom distracting. For those of us who have become bored with the ability of CG to provide “impossible” imagery, it’s still a pleasure to see what was once possible with just filmmaker ingenuity, photo-chemical technology and physical reality. The disk has a typically detailed and informative commentary from Tim Lucas, a short interview with Matheson’s son, and a documentary covering Arnold’s work for Universal in the ’50s. The anthology film was an interesting idiosyncrasy of Italian (and French) cinema in the 1960s, sometimes with multiple stories by a single director (Vittorio De Sica’s Yesterday, Today and Tomorrow  and Woman Times Seven ), sometimes with several directors contributing episodes tied together by a particular theme or performer (Boccaccio ’70 , Love and Anger , and the French-Italian Spirits of the Dead , which contained one of the masterpieces of the genre, Federico Fellini’s Toby Dammit). 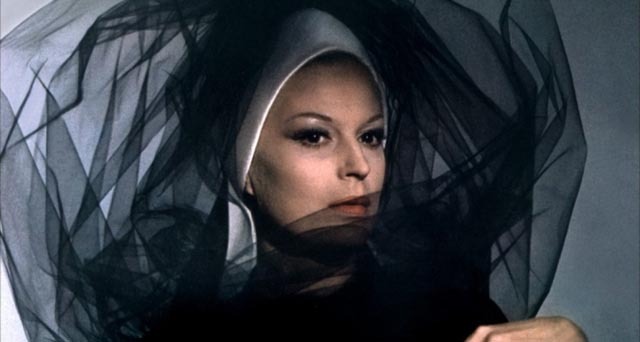 The Witches (1968) was conceived as a showcase for producer Dino De Laurentiis’ wife Silvana Mangano. With five stories (two just brief vignettes), it’s an uneven affair which doesn’t even attempt to conform to the ostensible concept of women’s supernatural powers (the film opens with a tediously long title sequence in which a cartoon hag repeatedly transforms into an image of Mangano). 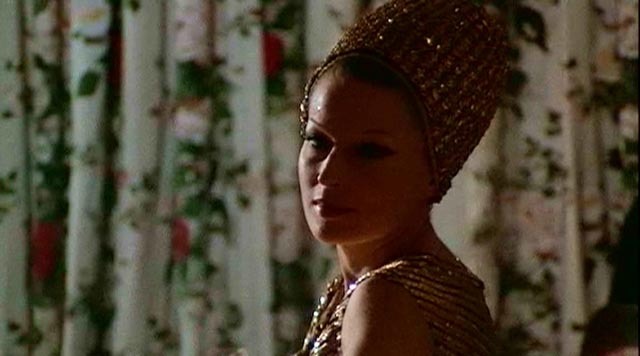 In Luchino Visconti’s The Witch Burned Alive, a famous model/actress arrives at a friend’s mountain retreat as the surprise guest at a party where she is alternately flattered to her face and denigrated behind her back. The weight of her celebrity, an identity imposed on her by others, exhausts her and she eventually collapses, giving the other guests an opportunity to strip away all the artificial aids which support her public image (wig, eye lashes, concealed bands which serve to tighten the skin of her face). There’s glee in tearing down the public icon, but no empathy for the real person trapped beneath the image. The segment climaxes in a strangely pointed moment in which the actress’ husband/manager urges her by phone to have an abortion because the child she desires will interfere with her (and thus his) money-making potential. Mangano was famously pushed by De Laurentiis to keep putting her career before her children, though she wanted to retire from the screen. Mauro Bolognini’s Civic Sense is a brief piece in which a woman in a hurry is delayed by a road accident which leaves a van driver injured. She offers to rush him to hospital, seeming to play the Good Samaritan, but instead uses his presence in her car as a justification for speeding across the city, defying traffic rules, in order to make a lunch date with her lover. The injured man finally staggers away from her car and collapses unnoticed in the street. Although played for comedy, the woman exhibits a brutal self-centredness which is less about female empowerment than it is about the abuse of class privilege. Pier Paolo Pasolini’s The Earth as Seen from the Moon is a fable in which a widowed man (comic star Toto) and his son (Ninetto Davoli) go in search of a replacement for their lost wife and mother, finally settling on a deaf-mute they find in the slums on the outskirts of Rome. But she too dies and is buried beside the first wife, though somehow she reappears in her humble home, transcending death to continue serving these two child-men. Although the film uses a light fantasy tone, exaggerated by the appearance of the two men – they look like circus clowns – once again this is not about female empowerment, but rather a disturbing reduction of the woman (who can neither hear nor speak) to a purely maternal role. Although colourful, this episode is cloying in its artificiality and forced comic tone; the men are not in the least endearing, but rather monsters of immature ego. In Franco Rossi’s The Sicilian Wife, Mangano is a peasant’s daughter who believes she has been rejected by a man she desires. In the film’s only overt reference to witchcraft, her father catches her stabbing a small bread figure with a needle and demands to know who her target is and why she’s casting this spell on him. Using her wiles, she appears to be reluctant to reveal anything, but is actually manipulating her father in order to stir and direct his anger towards the man. The result is a rapid escalation of violence as the father kills the would-be lover, triggering a series of revenge killings which eventually leaves many of the village men dead. The final episode, Vittorio De Sica’s An Evening Like the Others, is the most interesting for a couple of reasons. A wife, fed up with her boring banker husband’s lack of interest in her after years of marriage, tries to prod him into feeling some kind of renewed romantic interest, her efforts conveyed through a series of dream sequences which evoke a Fellini-esque fantasy or the stylized musical numbers of someone like Vincente Minnelli. She tries to remind him of his enthusiasm at the beginning of their relationship and indicates how that interest has faded; and then she tries to inspire jealousy by showing how others are still attracted to her. But finally she resigns herself to the way things are and submits to the dullness of their marriage. It’s a downer ending to a fanciful and comic conflict fueled by anger and resentment. But what gives it added interest is the presence of none other than Clint Eastwood as the husband, revealing a relaxed ability with comedy in a role which goes against the grain of (and mocks) his more familiar star persona. Made immediately after Sergio Leone’s Man With No Name trilogy (which had made him Italy’s biggest box office star, hence his somewhat inappropriate casting in this comedy), The Witches was Eastwood’s final Italian film before returning to the States and it points to an alternate path not taken by the actor, adding an interesting side note to his career. The image on Arrow’s Blu-ray, from a 2K restoration from “original film elements”, is colourful and detailed. 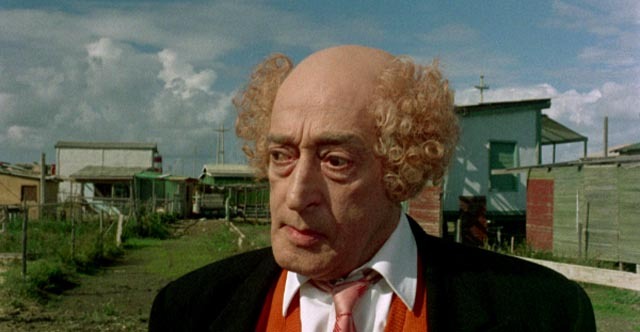 Each episode has distinctive visual qualities, the more surprising because all were shot by the great Giuseppe Rotunno; the film showcases his versatility as much as that of star Mangano. The extras are another commentary from Tim Lucas (who manages to make the film seem more interesting to me than it was while I was watching it), and the shorter English-dubbed cut. The latter is generally a painful listen, but the final episode features Eastwood’s own voice (it was obviously shot in English), which makes it the version to watch. Kiyoshi Kurosawa’s disturbing horror film was one of the first J-horror movies I saw on disk and its haunting atmosphere and enigmatic images stuck with me as I explored the genre in the following years. Revisiting it on Arrow’s Blu-ray, although its vision of the digital realm is inevitably dated, it seems just as disturbing. In Kurosawa’s apocalyptic vision, the Internet forms a bridge (or doorway) between this world and another dimension, a border between life and death, with the inhabitants of our world gradually being drawn over while the dead slip back here. If the technology seems somewhat naive, the film still works as a metaphor for the increasing disconnection between our physical selves and the disembodied digital existence we now spend so much of our time inhabiting. Like so many J-horror movies, Pulse viscerally evokes a world of which we only perceive the thin surface layer beneath which all manner of horrors lurk. 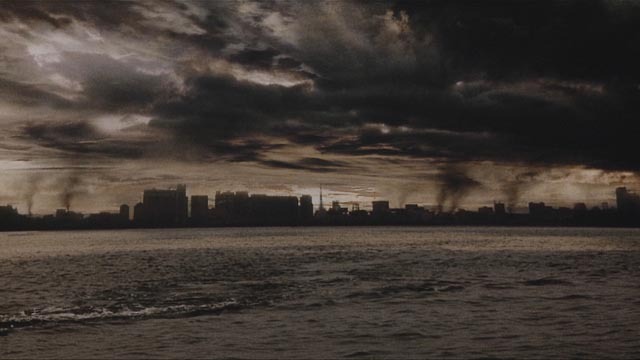 Shadowy glimpses at the edge of the frame and inexplicable events create a sense of unease as it gradually becomes apparent that the world is emptying out; a few characters try to comprehend what’s going on as the world disintegrates around them, moving towards images of apocalyptic destruction. Pulse is a landmark in Japanese genre cinema and remains one of Kurosawa’s best films. Arrow’s dual-format edition includes interviews with Kurosawa and cinematographer Junichiro Hayashi, archival featurettes, and a video appreciation by Adam Wingard and Simon Barrett. And then right after watching Death Wish, I saw a Michael Winner movie I hadn’t even heard of before. 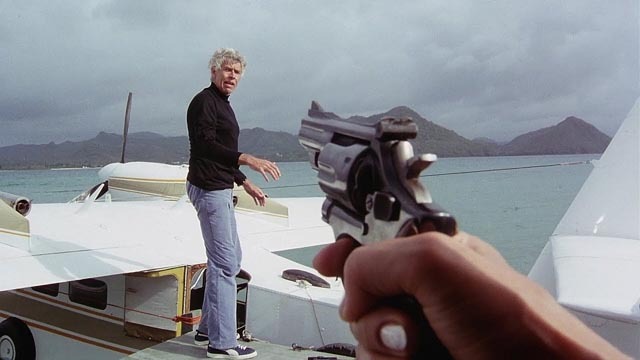 Firepower (1979), a bare bones Blu-ray release from Scorpion, is a fairly characterless international thriller from the period when ITC’s Sir Lew Grade was trying to transform himself into a mogul … and generally falling flat (although the same year he executive produced The Muppet Movie). 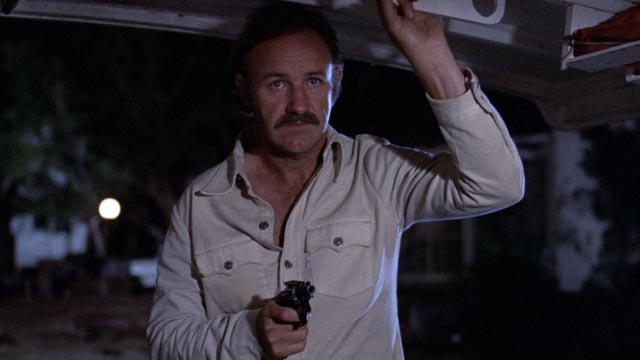 Firepower, written by the usually more reliable Gerald Wilson (he’d previously scripted Lawman, Chato’s Land, Scorpio and The Stone Killer for Winner), isn’t as dull as Raise the Titanic or as wacky as Saturn 3, but it is rather aimless. After the opening scene murder-by-bomb of a chemist, the man’s wife (played by Sophia Loren) persuades the Justice Department to hire freelance agent Jerry Fanon (James Coburn) to kidnap the reclusive criminal billionaire responsible and bring him to justice. The action takes place in Miami, New York, Washington and the Caribbean and the plot is convoluted to the point of incoherence, with crosses, double-crosses, triple-crosses, secret identities and motives within motives … all of which exists to justify chases, killings and explosions. Although Winner was fond of saying that he took projects on just so he could travel and see interesting places, he would usually at least invest some interest in the proceedings, but here you get the feeling he really doesn’t care enough to make the effort. Firepower is overly elaborate while being paradoxically lazy. By the end, you can’t tell who did what or why. Larry Cohen, an independent iconoclast, has had a long and prolific career writing and directing in multiple genres. His work is often tough and original and pretty rough around the edges, stretching limited budgets with the sheer force of imagination. Unafraid of absurdity, he will take an idea and follow it wherever it might go – resulting in one-of-a-kind movies like God Told Me To (1976), in which a series of random acts of violence lead to a revelation about the extraterrestrial basis of religious belief; and Q: The Winged Serpent (1982), in which an ancient Aztec god nests at the top of the Chrysler Building, occasionally swooping down to eat somebody, all viewed from the perspective of a small-time crook and chronic loser whom nobody is willing to believe. 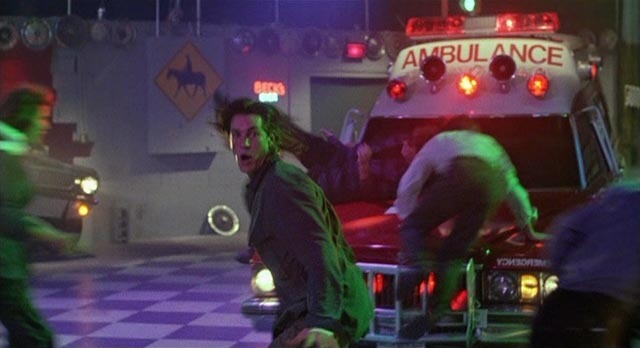 The Ambulance (1990) turns out to be something of a disappointment. Structurally, it’s a virtual remake of Q, but stripped of the fantasy element. Josh (Eric Roberts), a loud-mouth doofus who works as an illustrator for Stan Lee at Marvel, hits on a woman on a New York street, only to have her collapse on the sidewalk in front of him. An ambulance appears almost instantly and she’s whisked away. Josh goes to visit her at the hospital only to discover that she never arrived. He tries to report her disappearance to the cops, but his irritating manner and tendency to fantasize earn him the brush-off. So he has to start investigating by himself, eventually discovering that someone using that vintage ambulance is kidnapping diabetics. Stephen King’s mammoth time travel/Kennedy assassination novel is stripped way down for this eight-part adaptation. The problem for me was that the series focused on what I felt was the least interesting parts of the novel – paradoxically the Kennedy-Oswald plotline. All the early stuff in the book, in which smalltown teacher Jake Epping figures out the rules of time travel and begins trying to influence the past, is dropped in order to get quickly to Texas and the investigation of Oswald’s activities. Again, in the book this takes several years and King spends a lot of time on Jake establishing a new life and developing a relationship with librarian Sadie Dunhill. The book’s real strength is, as so often in King, the attention to everyday details, the nostalgia-tinged textures of ordinary lives. Although King obviously did a lot of research on Oswald’s activities, he doesn’t offer any new insights and finally settles on the “lone assassin with magic bullets” narrative originally laid down by the Warren Commission, eliding all the troubling inconsistencies which cast doubt on that story. The ironic, apocalyptic coda of the book is just as dissatisfying in the adaptation – saving Kennedy’s life results in a dystopian nightmare rather than the golden age Jake envisions. When I wrote about Severin’s Jack the Ripper Blu-ray a while back, I mentioned finding a remaindered copy of Bruce Robinson’s book They All Love Jack: Busting the Ripper in a local store. It took me about a month to read (I mostly read during my commute to work), but it was so rich and engrossing that I was sorry to see it end. Robinson packs it with years of research and thoughtful analysis, and despite its size (800 pages), he sustains a degree of moral passion which amounts to fury from beginning to end. The book is a fascinating work of social history (I’ll never again be able to view Victorian England with complacency), but also a remarkable feat of analytical detection. The case he builds is forceful and for the most part convincing, particularly in the way he breaks the atrophied shell of the case to expose pertinent details which have systematically been dismissed and even suppressed for the past 130 years. Robinson draws a detailed portrait of moral corruption and injustice which reaches to the highest levels of the Victorian establishment, an injustice which has been perpetuated by every shade of the post-Victorian British establishment down to the present. The book is essential reading for anyone interested not just in the Ripper case, but in the history of England and the British Empire. This entry was posted in Commentary, Review and tagged Action, Actors, Adaptation, Arrow Video, Blu-Ray, Directors, Fantasy, Horror, Italian Film, Japanese Film, Japanese Horror, Science Fiction, Thrillers. Bookmark the permalink.